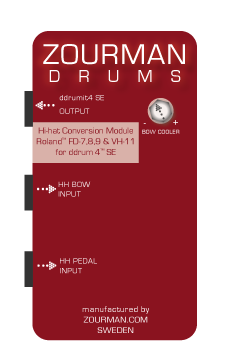 As a spinoff when I got the ddrum 4SE module and also from a couple of requests from customers asking - Can't you develop a hi-hat conversion for Roland hi-hats and the ddrum 4se? So well...I thought, no problem I can do this and I started the project - however - it was not so easy as I thought and it took me like 100 hours to complete. I am not 100% ready yet but I think it is working ok already - some fine tuning which still remains. I just bought a used VH-11 and ordered one of Zourman's conversion modules. Can't wait to play it with my ddrum 4 SE. 3) more sound variations between open and closed positions. My plan is to improve my ddrum based kit slowly and perhaps eventually get a 2box when the new ones finally get to the US. So my strategy is to get triggers that will work with ddrum 4 SE *and* Drummit 3. Next step is a new kick drum. The original ddrum kick drum is pretty good but I have issues with it's stability and tendency to retrigger. Anyone have any recommendations for either solving the issues and/or a better kick drum solution that is ddrum 4 SE and Drummit 3 compatible? I am really hoping that the ZD Conversation for dd4se will meet your expectations! It is going to be interesting to see if you like it! Anders / www.zourman.com / hi-hat conversations for 2box & DD4SE. I should be ordering a conversion module by summer. Are they a limited run? Cheers for the blood, sweat & tears! No - this is for life...:-) - I have parts to create about 25 boxes...and I build them to order. Fantastic! While I don't mind the DD4SE hi-hat, it takes some finagling to get it to, for example, trigger Addictive Drums correctly. I think the more modern offerings will be less problematic. Now, if I could only completely figure out the compression scheme that Clavia used for the DD4/4SE samples, man it would really unlock the potential of that module! That being said, I still fancy a Drumit 3 module in the future. The DD4SE sound compression was a complex and advanced thing. The sounds were compiled using a 68K based MAC with a custom written Clavia app. The fabric sounds are actually consisting of 10 layers of 8 bit samples and a very special "round robin with filters" to take away the machine gun effects. The sounds were compressed 6 times in size. So I am guessing it won't be possible to create new sounds to the DD4SE...too much special stuff and solutions. Yeah, it seems as though the Ddrum4SE compression algorithm is lost to posterity. What a shame!